"Jesus will always care for you." In this hectic pace of the modern world, you and I are miniscule items among the millions who feed the selfish 'me world' to flourish. In the churches, communities, offices and everywhere else, people are approached as machines. But Jesus sees, calls, touches and heals us in compassion with real love for his children. We see here two approaches - the compassionate and genuine way of Jesus, and the hypocritical way of people. It took 18 years for a crippled woman who was a regular church-goer to be accepted, loved and healed from her infirmities. The religious leaders could not and did not do anything for her. But the first day Jesus saw her, he called and healed her thus freeing her from shame and sickness. The temple priests were upset that Jesus had healed her on Sabbath day, to which Jesus out rightly called them “You hypocrites”. He did so because they would untie their animals and care for them on Sabbath Day, but refused to rejoice when a human being was freed from satanic bond and healed. The religious leaders saw healing as part of a doctor's profession for money. So practicing one’s profession on the Sabbath was prohibited. 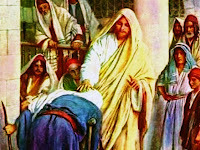 They could not see beyond the law to Jesus’ compassion in healing the crippled woman. Actually healing is the work of God. And the root cause / source of all the illness sprouted from the bosom of the Satan, the serpent who cheated Adam and Eve, the first couple. In a nut shell, we should be in Jesus and Christ should be within us. We should say goodbye to all our hypocritical church attendance and faithless non-Christian way of life from Monday to Saturday. No human effort can eradicate the sickness of cancer, heart failure, diabetes, HIV and Aids etc. Even if Science can find a solution, then some other more deadly sickness will emerge. So the only solution is to look up to Jesus who was crucified for our infirmities and to crush the face of Satan. I saw Christ in action healing a bent woman in the parking lot of Tim Hortons in the intersection of Elsmere and Birch mount one Sunday after Mass. One literally crippled woman was held by her hand and led by an old man to their car from Tim Hortons. The man was very patient, smiling and concentrating all his attention on each and every step to avoid any fall or injury for his companion. They came to the car and very carefully he made her sit on the seat. Then he closed the door and went to the driver's side and they drove away. In all this time, her face was beaming with love and there was not an iota of bitterness, pain or any sign of her sickness. I was literally dumbfounded and happy to witness such a scene. I strongly believe that Christ is still in action through this kind of millions of compassionate living human beings. "Jesus was teaching in one of the synagogues on the Sabbath. And there appeared a woman with a spirit that had crippled her for eighteen years. She was bent and quite unable to stand up straight. When Jesus saw her, he called her over and said, ‘Woman you are loosed from your infirmity.' He laid his hands on her and immediately she stood up straight and began praising God."